While building a custom SharePoint List form Using SPFx web part, one usually encounter a situation, where an elevation of current user context is required. Especially, where the user does not have permission over the list and we would like to collect information from them. For example, a feedback form or a site collection request form, where a user should not have direct access to view or edit other items but he/she should be able to make an entry(create item) into the list. Below is a schematic representation of overall architectural flow that has been described in this article. A user does not have access to SharePoint list has been provided an Interface which is build using SPFx web part. A user makes an HTTP post request via SPFx web part which triggers MS flow. 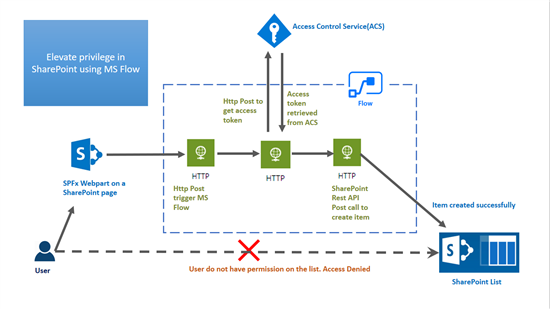 Next consecutive action present in the flow makes a request to ACS to retrieve Access Token. 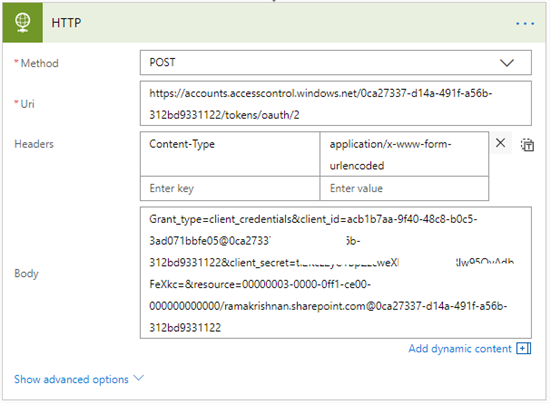 Once Action Token is received as a response another SharePoint REST API call has been performed using this action token. The concept has been split into two major division. Step 1) Login to SharePoint Online Site collection and navigate to _layouts/15/appregnew.aspx (https://<<domainname>>.sharepoint.com/sites/dev/_layouts/appregnew.aspx) to generate Client ID & Secret. Step 2) Generate Client ID & Secret. Provide a Name of the app(which is "MyFlow" here). Enter AppDomain as "localhost" and redirect URI as "https://localhost" and click on Create. Important: Make note of the Client ID & Secret that has been generated. Step 3) Go to _layouts/15/appinv.aspx (https://<<domainname>>.sharepoint.com/sites/dev/_layouts/appinv.aspx) & register the app by entering Client ID generated in previous step. Click on "Lookup" button. Add the below XML in Permission Request XML and click on Create. Step 4) Select a list from dropdown where elevated privilege is required. (here the list name is NewList1) and click on "Trust It". Step 5) To verify the registration, navigate to _layouts/15/appprincipals.aspx, Here note Tenant ID as well. 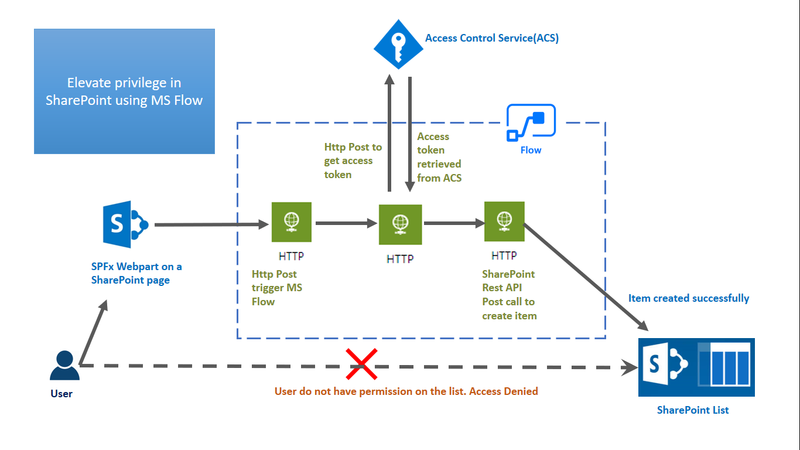 Step 1) Login to https://flow.microsoft.com and click on "Create from Blank" as the flow need to be created from scratch. Step 2) Add Action "When an Http request is received" and include the below JSON in the Request body. This accepts a title as body parameter along with its value. 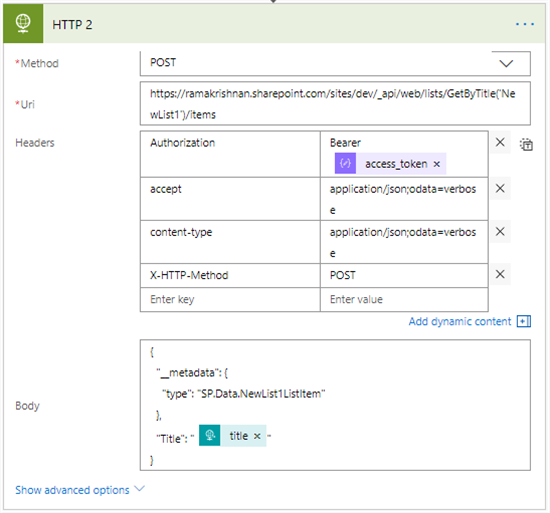 Step 3) Add New step and include new action in flow "HTTP" post since access token is required to make REST API call and include the below value as displayed in the screenshot below. Replace the Client ID & Secret along with the Tenant ID which was noted in the previous section. 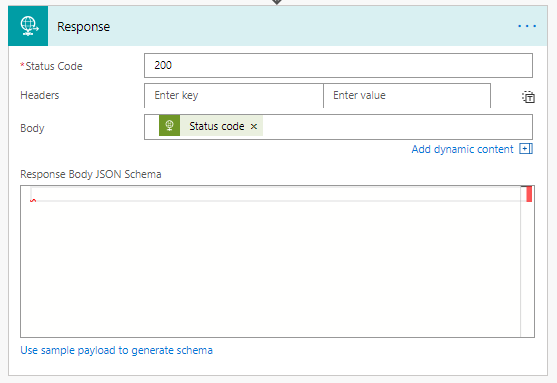 Step 4) Add another new step and add/include Parse JSON action as we need to read the access token. 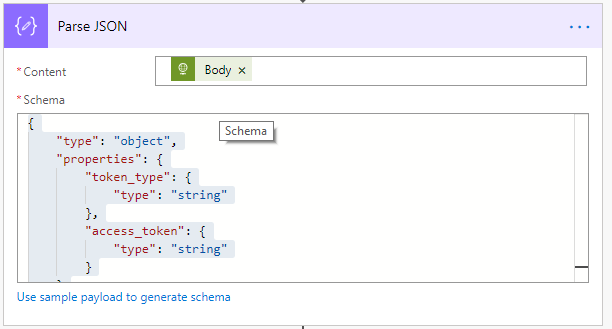 Include the content as the body of previous action & below JSON schema format. Step 5) Add New step and include new action in flow "HTTP" post as we will make REST API post call. Include the below value as displayed in the screenshot below. Replace URL of the site & list title. Step 6) Add New step and include new action in flow "HTTP" post as we will make REST API post call. Include the below value as displayed in the screenshot below. Replace url of the site & list title. Step 7) Add New step and include new action in flow "Request - response" to send a response back based on the out received from the previous step. Include Status code in the body parameter as displayed in the screenshot below. Step 8) Provide a Name to the Flow and Save. Make a note of the URL from the first action(When an HTTP request is received) which is used to trigger the flow. Follow the below steps to create SPFx web part that will be used to trigger Flow which in turn create an item in SharePoint list. Kindly refer this article to know the pre-requisite for creating SPFx web part. Step 1) Open Windows Powershell. Note: If SPFx solution already exists and only web part needs to be added to an existing solution, then directly jump to Step 5. Step 5) Once the project is created open it in Visual Studio Code using the below command. Step 6) Modify the SPFxFlowWebPart.ts and replace the below code. The below code provide a text box as input along with the property field which accepts FLOW URL as input. Step 7) Replace the code present in en-us.js location at (solutionpath > src > webparts > spFxFlow > loc >) with below code. Step 8) Replace the code present in mystrings.d.ts location at (solutionpath > src > webparts > spFxFlow > loc >) with below code. Step 9) Run the below command in windows PowerShell to test. Step 10) Provide URL of the Flow noted in step 8 of the previous section and provide Item Title and click on Create Item. Refer the below screenshot. A new item will be created in the specified list (NewList1). Below is a glimpse of overall flow where the SPFx web part is added in a local workbench and item title is provided. 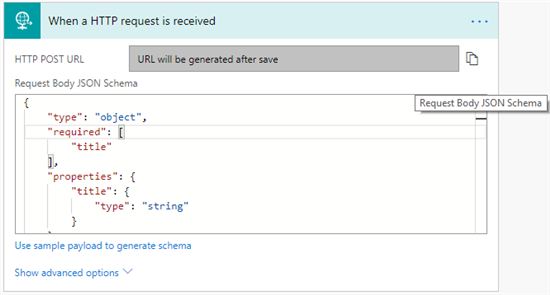 Behind the scene, flow makes multiple HTTP calls and finally add an item in SharePoint on behalf of the user. IntroductionDuring customization of complex form using SharePoint Framework, there is an additional effort required by developers to include taxonomy picker & people picker. In this article, it is explained how taxonomy & people picker can be included in SPFx webpart using Reusable React Control . Getting Started1. Create SPFx web partKindly refer this article to know the pre-requisite for creating SPFx web part.